We had a fantastic day today at Trinity Laban Conservatoire of Music and Dance working with this lovely group of adults during their South Africa themed day! 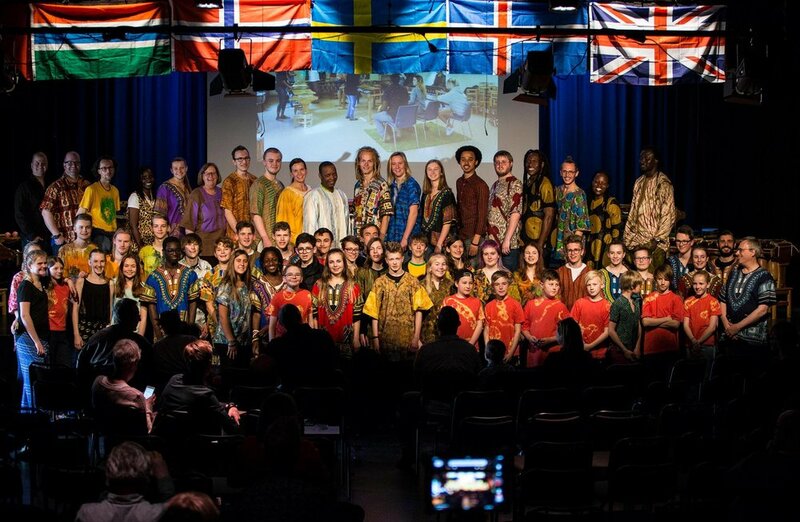 African Marimba Music has just come back from a lovely long weekend in Paris where we got the opportunity to teach and perform at the inaugural ZimFest Paris. The weekend was all about cultural music from Zimbabwe, even though we of course snuck in some material from Botswana, where Otto, founder of African Marimba Music, comes from. On offer were marimba, mbira and dance workshops, which included elements of singing as well. On day one of the festival, workshops started off bright and early at Théâtre de Verre. That evening, the teachers and other collaborators came together to give a lovely concert of traditional music from Zimbabwe - performed on mbira and marimbas, accompanied by drumming, singing and dancing. On day two, the students mainly focused on solidifying all they had learnt the day before, and in the afternoon they got the chance to perform for one another and showcase some of what they had learnt. It was such a lovely weekend in Paris with a beautiful mix of cultures and people from all walks of life coming together through music. Our teaching took us up to Kettering today, where we had the great honour of working with teenagers of African heritage, most of whom were born here in the UK, or moved here when they were very young. We shared some folk songs from Zimbabwe on the marimbas, and got to sing and dance a bit as well. We spent a few hours over in Southend-On-Sea this afternoon sharing some cultural music from Zimbabwe with the local people. We performed a bit and led a few short music workshops on the marimbas. In August we had the honour of being a part of The Midnight Run - a walking, arts-filled, night-time cultural journey through a city. It gathers strangers and local artists/activists to explore, play and create whilst the city sleeps. Here's a highlights video of the Battersea edition of the Midnight Run, which African Marimba Music's founder took part in as a workshop leader. Highlights of the marimba workshop are near the end of the video. What a weekend it's been working with lovely young musicians from Sweden, Norway, Iceland and England - and working alongside a wonderful teaching team of African cultural arts practitioners from Zimbabwe, Tanzania, South Africa, Guinea, The Gambia, France and Sweden! We've returned to London with a thoroughly nourished soul after all the beautiful music and dancing! The camp started off on Friday afternoon with a round of workshops, before we all gathered in the main concert hall for an evening of live music led by the workshops teachers. There was mbira music, sabar drumming, kora, and of course, marimba. The camp then continued on Saturday morning with a full two days of workshops. Below you can see a picture of where we were doing our teaching. We had a lovely two days and worked with a total of 8 groups - ranging from young children to young adults. Below you can see a clip of one of the songs the group from Iceland learnt. It's a folk song from Botswana called Silang Mabele. On Sunday afternoon, all the student groups got to share some of what they had learnt over the weekend. The oldest group closed the concert with a lovely Mhande-rhythm song from Zimbabwe called Cheke. It's an mbira song arranged by Jacob Mafuleni for the marimba, and the song is about crossing the river.